The What: Extron Electronics has added nine additional eBUS Button Panels. Six of these provide volume control, microphone level, and muting control, while the other three provide full-featured video transport control. The What Else: All of these easy-to-use control panels connect to an IPCP Pro control processor and feature customizable, soft-touch buttons that are backlit for easy operation in low-light environments. Each model features two eBUS ports for easy system expansion. eBUS button panels are linked to the control processor and to each other using a single cable that carries both power and communication. 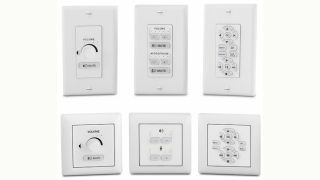 eBUS Button Panels are available in Decora, EU, and MK form factors. For applications worldwide, the EU models are compatible with Flex55 modules, mounting kits, and enclosures. "These new audio and video transport control eBUS button panels expand system functionality and increase control system design options," said Casey Hall, vice president of sales and marketing for Extron. "With the introduction of 19 new button panels to our eBus family, AV system designers can now choose from over two dozen convenient and cost-effective options for AV system control." Extron’s integration-friendly eBUS technology is based on a unique digital bus architecture that allows for easy control system expansion, greater design options, and future upgrades. As with its TouchLink Pro touchpanels, eBUS button panels are designed for use with any Extron IPCP Pro Series control processor. A single eBUS button panel can be used as the AV control interface for a smaller system, or multiple button panels and touchpanels may be combined when a more elaborate control system is required. The Bottom Line: eBUS button panels come in industry-standard form factors and multiple units may be linked together by a single cable that carries both power and communication. Since they have the same physical appearance as Extron’s range of MediaLink controllers, eBUS button panels can be used alongside them throughout a facility while preserving a consistent look and user experience. Buttons can be easily customized using the online Custom Button Builder application.